I spent some time back home in Utah over the summer. While I was there I overheard someone say, "I don't know who Martin Luther King was, but I love his day because I get the day off of work." And someone else replied with, "All Martin Luther King did was give a speech." This conversation really got my blood boiling. In my opinion no one should be unaware of who Dr Martin Luther King was and what he did. He, and the many people who worked with him, changed our country. This country would be a very different place if it wasn't for all the civil rights work that his followers accomplished through non-violent protesting. It's important to me that my children understand the importance of Dr King and the Civil Rights Movement. We've lived in Alabama for about 9 months and already we've visited a lot of landmarks associated with struggle for Civil Rights. I decided that the perfect way to spend Martin Luther King Day would be to visit several of the places in Montgomery where he participated in important civil rights events. 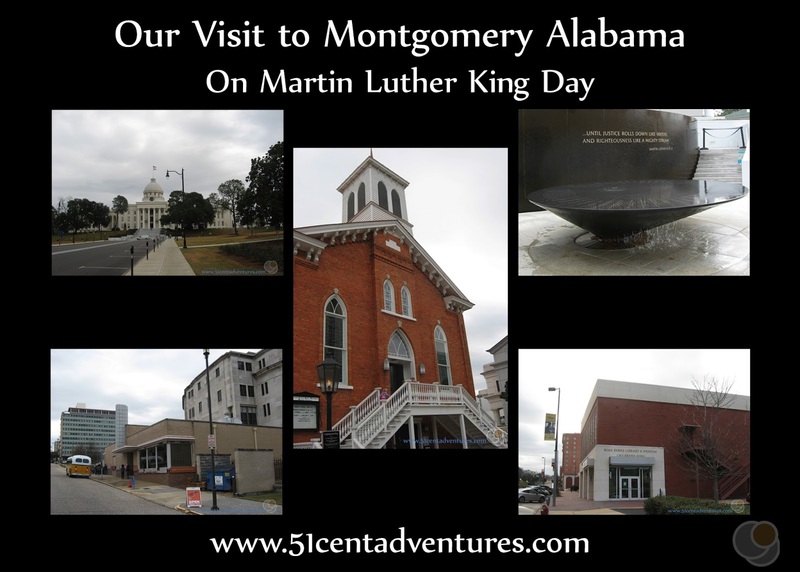 Last week I wrote a post describing the 5 places I wanted to visit in Montgomery on Martin Luther King Day. This week I'm going to tell you how our trip went. First off, I have to show you a picture from Saturday. We decided to go miniature golfing at the Adventureland Theme Park in Dothan, Alabama. The day had started out a little chilly, but by the afternoon it had warmed up. The weather was absolutely gorgeous. 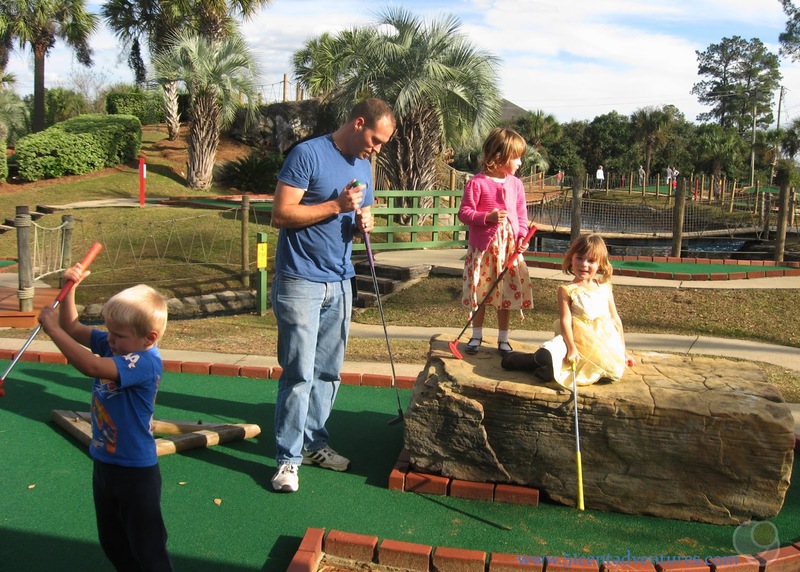 We had a wonderful time golfing. It was one of those perfect family outings. So what does that have to do with Martin Luther King Day? Well nothing really. I just wanted to show you that the weather can be pretty nice this time of year, and that my family can have an enjoyable time together - because that wasn't really the case on Martin Luther King Day. The day started out with the kids waking up way too early for a holiday, and everyone started off on a grumpy foot. My husband and I kept going back and forth on whether or not we even wanted to go up to Montgomery that day. Taking grumpy kids out in public isn't exactly our favorite thing to do, and we've had some bad experiences in the past. If we weren't feeling up to it then we knew we shouldn't attempt it. But as the day went on everyone seemed to be in better moods (parents included.) So a little before lunch time we decided that we should go. We hurried to pack some food and then we were on our way. Over 90 minutes and two bathroom breaks later we arrived in downtown Montgomery. We were hoping to visit the Dexter Avenue King Memorial Baptist Church first, but there was some sort of commemoration going on at the Capitol Building, and so there wasn't any parking available. 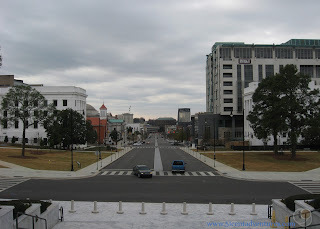 We ended up around the corner near the Civil Rights Memorial. We kind of wanted to go check out the commemoration. However, the commemoration involved someone speaking into a microphone and my son is very sensitive to loud speakers. 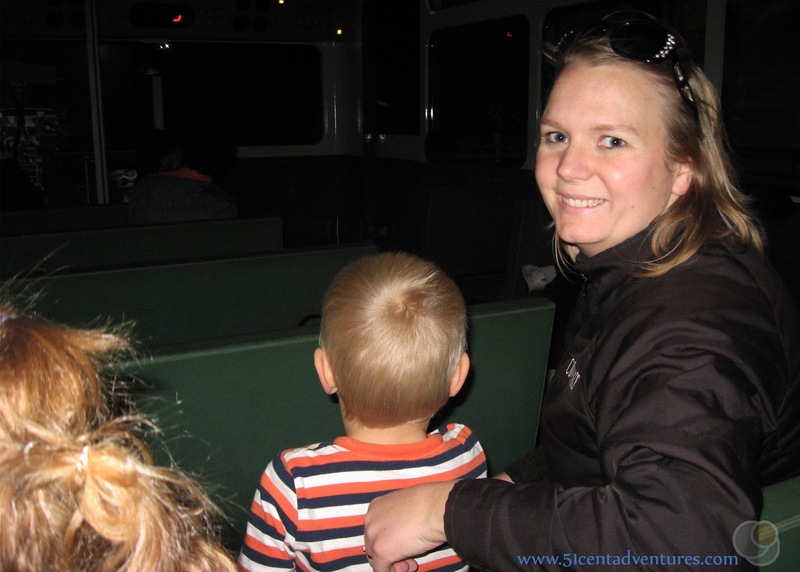 The last thing I wanted to do was start out our day with a sensory meltdown from my son. So we decided to go to the Civil Rights Memorial and Center first. The Civil Rights Memorial is located at 400 Washington Ave. 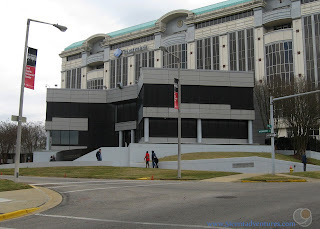 The Civil Rights Memorial Center is a small building behind the memorial. 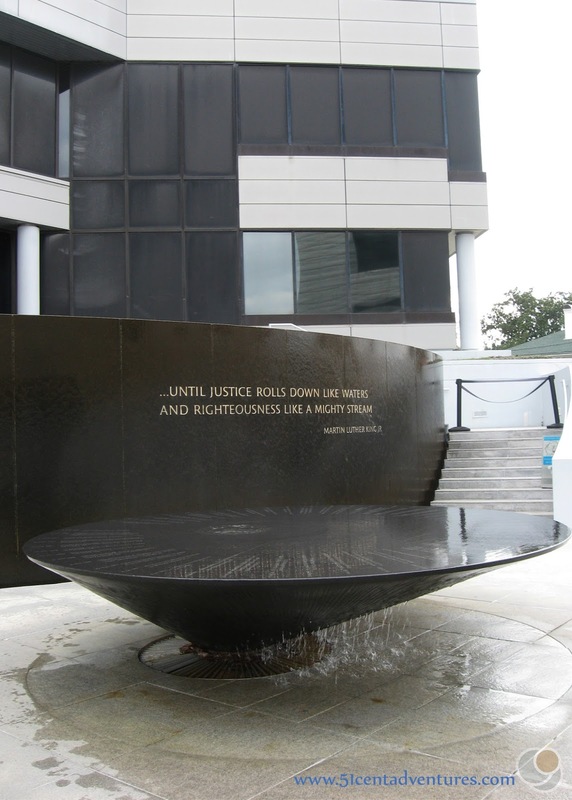 The memorial has the names of people who died during the Civil Rights Movement engraved on black stone. Water constantly runs over the memorial. Behind the memorial is a black wall with this quote from Dr King. " . . . Until justice rolls down like waters and righteousness like a mighty stream." We probably would have spent some more time admiring the monument, but we were freezing. So we hurried to go into the Memorial Center. I'd been hoping to talk to my kids about what they'd see inside the building, but we hadn't really had a chance to do that. So instead they were thrust right into Civil Rights history. The building is kind of a grim reminder of the struggles people have gone through to receive civil rights. The lighting was dim and there were black and white photographs everywhere. If it had been just my husband and I we could have spent a long time reading all the different signs. However, the kids were bored and a little scared. We went through the building as quick as possible, which was fine because the normal $2 admission fee had been waved for the holiday. As we were leaving the museum the workers gave my kids stickers. All the kids were happy about their stickers. My Recommendation for the Civil Rights Memorial and Center: The Memorial can be enjoyed by everyone. However, the Center is probably best for adults and older children. A lot of the images will be confusing to young children. Children under 18 get in for free though so it's not like you'll be wasting your money if you visit this place with children. We left the building, and were back in the cold. 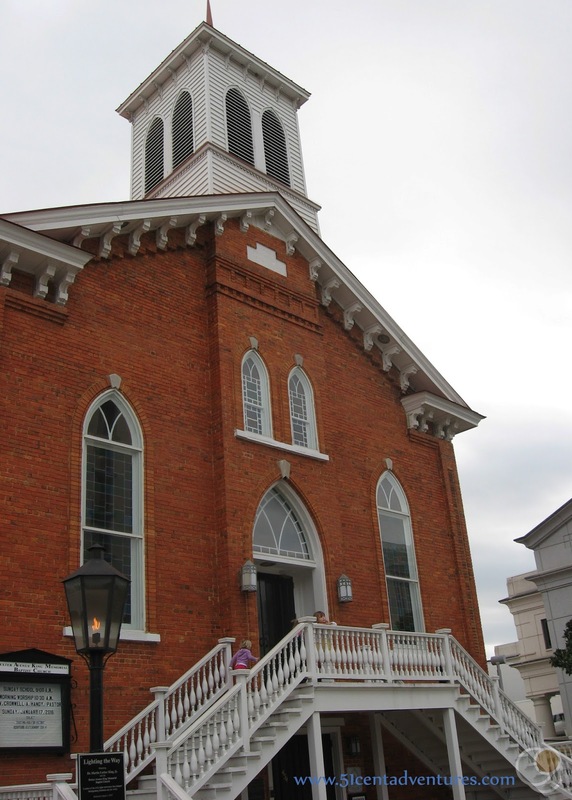 We hurried down to the Dexter Avenue King Memorial Church at 454 Dexter Avenue. Dr King was the pastor of this church from 1954-1960. From here he helped organize the Montgomery Bus Boycotts in 1955. This was the main place I wanted to visit so imagine my disappointment when we discovered that the building had closed for the day. This is the second time I've missed out on a tour of this building. I guess that's what I get for being wishy-washy about my plans that morning. One of the church workers came out of the building on her way to her car. I asked her if the Parsonage where Dr King lived was open for tours. She said it had been closed all day. 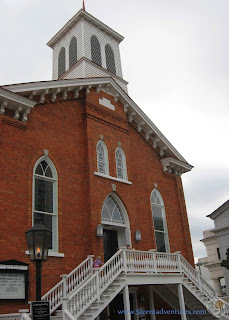 My Recommendation for the Dexter King Memorial Baptist Church: I still haven't had a chance to take a tour of this building so I can't say whether or not that is worth the money. But I have enjoyed seeing the outside. 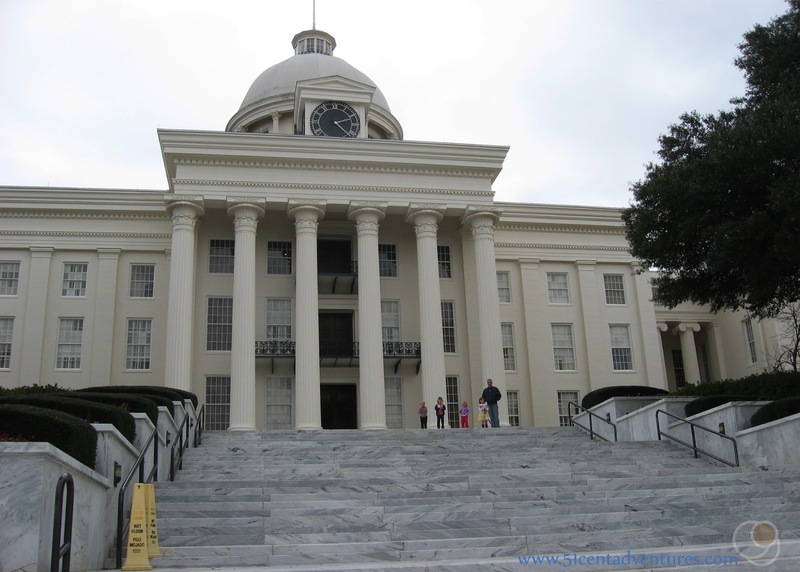 This is an important place in the history of Alabama and the history of the United States. We were freezing, but the kids wanted to walk up to the Alabama State Capitol. The commemoration that had been going on earlier was over, and so there were hardly any people around. As we walked we passed the crosswalk that has been painted to look like footprints. 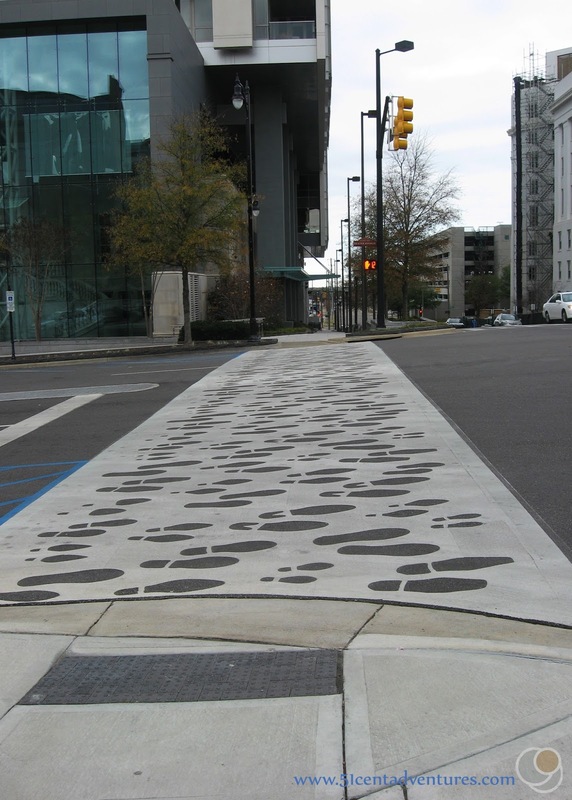 This is one of the subtle reminders that this is the route that the Selma to Montgomery March took as the participants approached the capitol in March of 1965. We visited the capitol at the end of May last year. On that visit the weather had been very hot and humid. Our walk up to the capitol had seemed to take forever. This time the weather was very cold and we hurried up to the building to stay warm. I told everyone that the capitol was closed for the holiday, but they all wanted to climb the steps anyway. I was impressed by the size of this Live Oak. 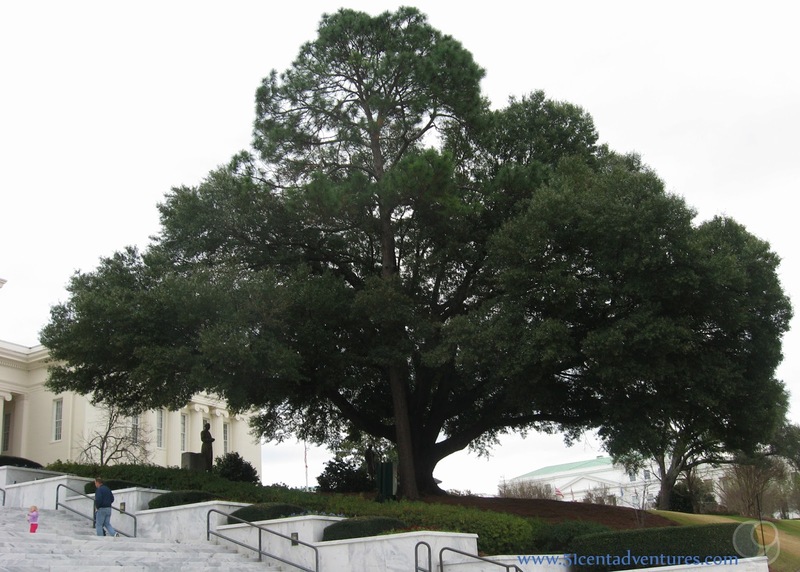 Live Oaks are considered evergreens. Even in the winter they are covered with leaves. This is the view of Dexter Avenue from the steps of the capitol. You can see the Baptist church on the left side of the street. 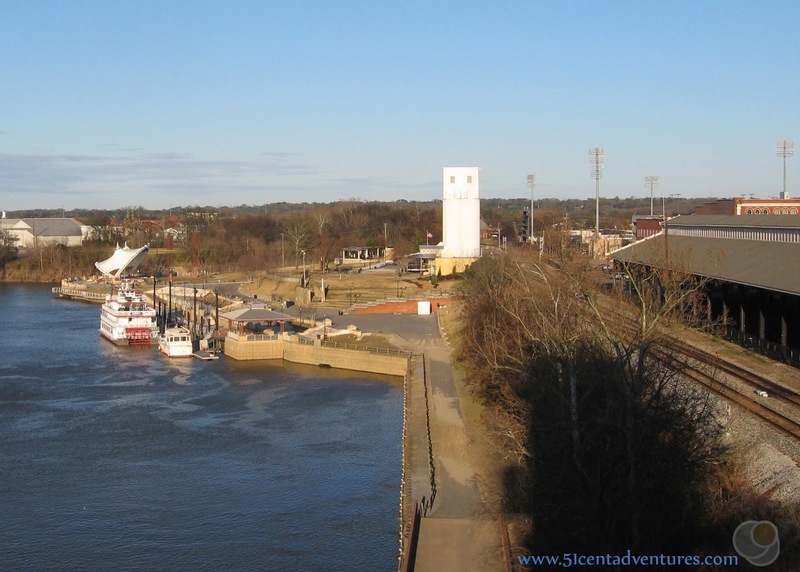 At the end of the Selma to Montgomery March, Dr King gave a rousing speech from this location. I like to imagine what it would have been like to look out over all his supporters. 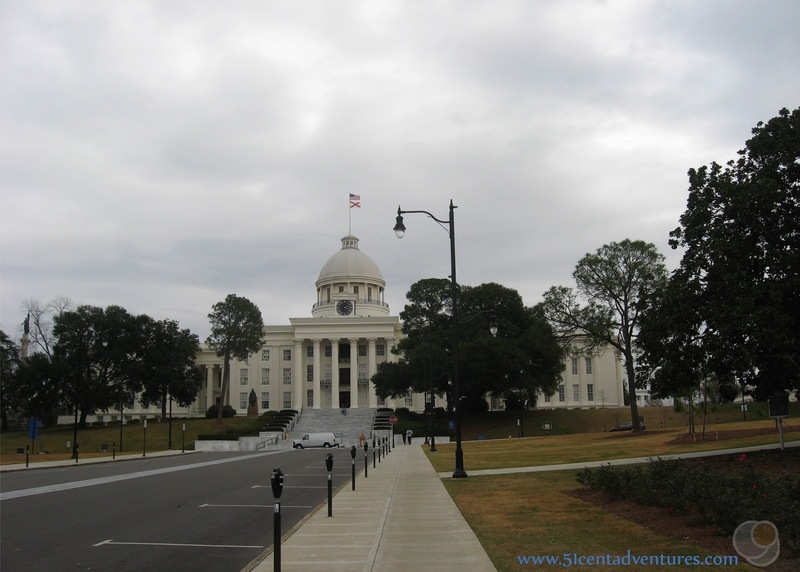 My Recommendation for the Alabama State Capitol: Capitol Buildings are always fun to visit. This one has a lot of history. In addition to the Civil Rights Movement History it was also the Capitol of the Confederacy during the Civil War. 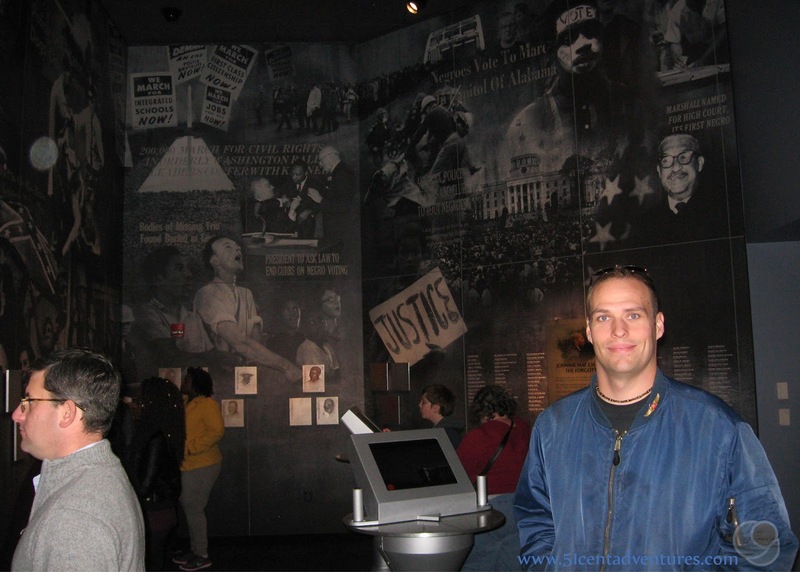 On regular weekdays and Saturdays there are free tours available that are very informative. When we were done at the capitol we hurried back to the car to get warm. So far I wasn't too happy with our experiences. It was just too cold to really appreciate anything we'd seen. I told myself that at least I was trying to visit these important places. I was hoping that one of the other places on my list would help redeem the day. 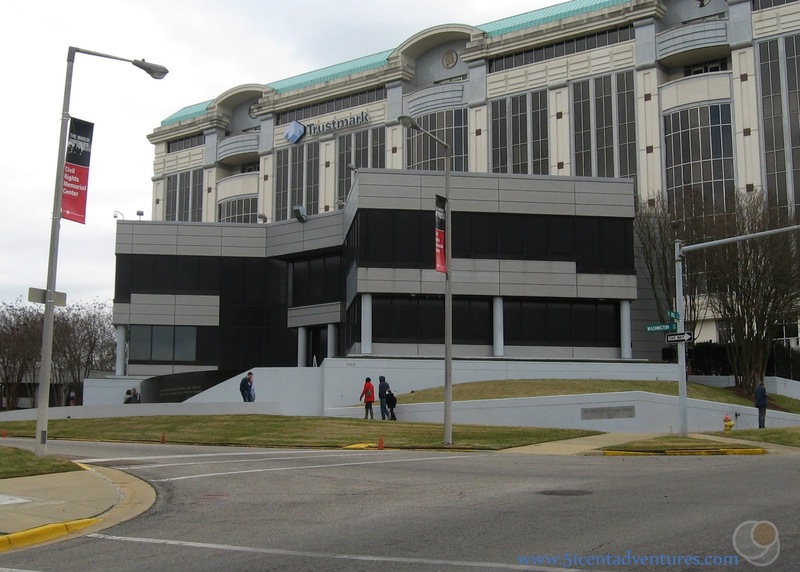 I wanted to go to the Rosa Parks Museum, but I wasn't sure how to find it because I'd left all my notes and my good map of Montgomery home. (Yes, sometimes even the best of us are unprepared.) Thankfully the city has pretty good signs that lead to the important landmarks. 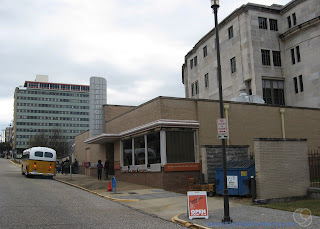 Even with the signs we still took a wrong turn, and ended up at another place on my list - The Freedom Riders Museum. This museum is located in the old Greyhound Station where 21 Freedom Riders were met with a violent mob of 200 people in 1961. The mob beat the Freedom Riders with baseball bats and metal pipes. It's one of those dark moments in Montgomery history, and I'm actually kind of surprised that they have turned the Greyhound station into a museum dedicated to the event. Dr. King no longer lived in Montgomery when this happened, but he arrived few days later to give a speech in support of the Freedom Riders. There were more threats of mob violence during the speech, and the Federal Marshals were called in to keep Dr. King and other safe. If my kids were older I would have taken them inside this museum, but I wasn't sure if they were ready for the images they would see in there. So instead I just hopped out of the car to take a picture of the exterior. Before I took the picture a lady told me that there was a movie being filmed in front of the museum. They were between takes at the moment so I was welcome to take pictures. She said the movie was about Rosa Parks. My Recommendation for the Freedom Riders Museum: This museum is dedicated to reminding people about an unfortunate event that illustrated the cruelty of one group of people and the bravery of another. I didn't go inside the museum so I don't know if it's worth the price of admission. Just seeing this location made me think about how different the past was from today. I got back into the car. We back tracked to find the Rosa Parks Museum. This is located at the spot where Rosa Parks refused to give up her seat to a white man and was arrested in December of 1955. 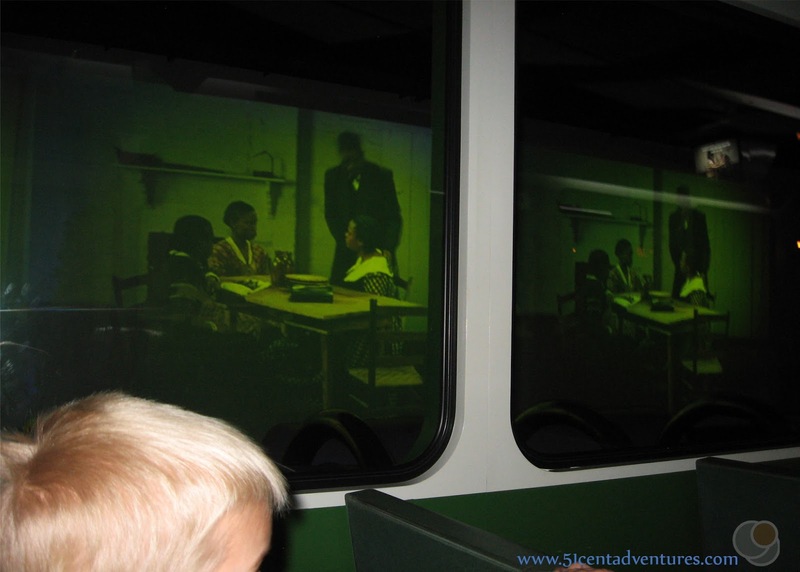 After she was found guilty of disorderly conduct the Montgomery Bus Boycott was started. It was led by Dr. King and lasted almost a year. The boycott ended when the Supreme Court ruled that segregation of the buses was unconstitutional. I figured of all the Civil Rights events this is the most "child-friendly" story. (There isn't any death involved.) The museum even has a "Children's Wing." I hoped that my kids would really get an idea for what the Civil Rights Movement was able. We could have bought tickets for both the Children's Wing and the main part of the museum, but I figured our kids would be bored at the main part so we just got tickets for the children's wing. The tickets were $7.50 for adults and $5.50 for our kids over age 4. We were directed through some doors and told to sit on a large bus. This bus was a "time travelling bus" that would help us view different events in history. But I was very disappointed by the end of the presentation. I thought we'd at least get to see Rosa Parks refuse to give up her seat on the bus. But instead the movie stopped just short of that and directed us to go to the other wing of the museum to learn the rest of the story. At $7.50 a ticket I felt very cheated. So instead I just told my kids what happened next, and we went back to the car. 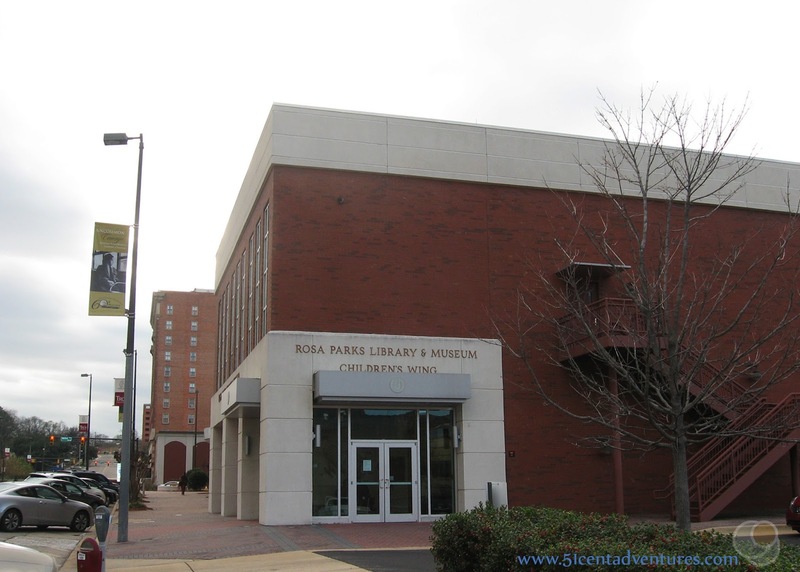 My Recommendation for the Rosa Parks Museum (Children's Wing): I found the museum to be educational, but I also felt it was over-priced. More could be done to make the Children's Wing it's own complete museum. It also could do a better job of appealing to young children. A lot of the things in the presentation went over my children's heads. That was the end of my list of things to see for the day. Part of me worried that we'd wasted our time, but everyone seemed to have had a good day. I'm pretty certain we would have just stayed home and watched movies all afternoon if we hadn't gone on this trip, so at least we'd done something educational. We went to the Montgomery Visitor Center parking complex near the Alabama River. Train tracks go right by the building. My son loves trains so we were hoping to see a train while we ate the little dinner I'd packed earlier. We ate in the car because it was just so cold outside. I'd brought some gummy worms and the kids had fun eating those. Honestly, I think this was everyone's favorite part of the trip. There is a bridge that crosses over the rail road tracks and over looks the Alabama River. We took the kids up there to get their wiggles out before the drive home. 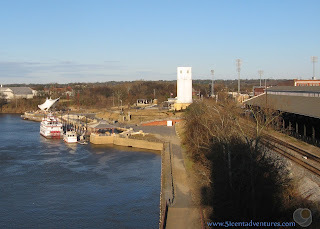 Last year we walked along this river and looked at the Riverboat, restaurants, and amphitheater. That hot day seemed like a very long time ago. 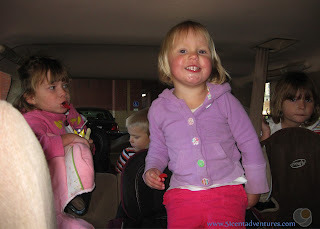 Then we got back in the car, cranked up the heat, and drove home. I'm not sure if the kids really learned anything about the Civil Rights Movement. I know I learned a few things and so did my husband. One day my kids will be old enough to learn more about Martin Luther King and the work he did in the Civil Rights Movement. 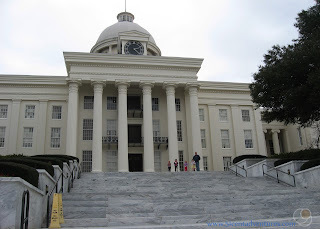 I'm glad that I have pictures to show them of our visits to Montgomery. And I'm sure that knowing they have stood in those historic locations will help my children appreciate the things they'll learn. One thing is for certain. My children will never have a reason to say that they have no idea who Dr King was or that all he did was give a speech.